Closed circuit television cameras are a virtual necessity for many different types of businesses. For residential use they are becoming much more popular as prices have become more reasonable and thieves get more sophisticated. These cameras pull double duty as a visible deterrent to theft and vandalism, and as a means of collecting evidence and identifying perpetrators in the case a crime is commited. They can also monitor employee activity in sensitive areas. A “closed circuit” refers to the fact that the cameras have traditionally been hard-wired to be connected directly to the monitors and recording device. Physical access to the camera system itself is required to manipulate the video feed. You’ll thus often see these cameras mounted up in hard-to-reach areas, and also often protected by a dome that both protects the cameras from vandalism and obscures the direction they are facing. Recently, wireless technology has made it possible to have cameras that do not use coaxial cables for video transmission, but it is important to have a system that encrypts these video signals so they cannot be intercepted. Even if encrypted, wireless systems are also still more vulnerable to electromagnetic interference from sources such as high voltage power lines or nearby radio towers. The wireless cameras are also generally limited to a maximum range of 200 feet of transmission, less if there is a wall or other obstruction. It is also generally still recommended that these wireless cameras have a hard-wired power source, whether that be DC voltage or power delivered via Ethernet. The aforementioned dome cameras are generally used indoors, most often in retail environments or offices where the presence of obvious cameras might be off-putting to patrons or employees. Cameras for outdoor use are encased in a weather-resistant box or cylindrical “bullet” housing. The basic analog camera has a fixed field of vision and does not move, so multiple cameras are used to cover wide areas. There is a more advanced form of camera called the “PTZ”, short for Pan-Tilt-Zoom. These cameras can be controlled remotely from a security station and allow the operator to discreetly manipulate the camera’s field of vision. Good examples of PTZ cameras are the ones famously used in casinos to zoom in on and follow players suspected of cheating, but they are also used in a wide range of other settings and the functionality is becoming increasingly common even on more affordable models. Storage capacity is also a major consideration. The better the video quality, the more storage space it will require. The general measure of storage is “frames per second” or FPS. Lower FPS makes for choppier video but also requires less storage space. Camera systems can also compress the video to a lower display resolution, but this is also a trade-off of video quality for storage space. The quality at which you will see no gaps whatsoever in the video is 30 FPS, but each camera recording at this quality will require about two and a half gigabytes of storage space for every 24 hours of footage it records. The size of the lens determines how wide the viewing angle will be. Lens size is measured in millimeters, and the larger the number the more narrow and focused the viewing angle is. For example, a 12mm lens would be appropriate for focusing on a single museum exhibit, while a 4mm lens would be used to film an entire room. The amount of light each camera requires to capture a visible, usable image is expressed in “lux.” The larger the lux number, the brighter the light source. Interior lighting is typically around 500 lux, while an outdoor setting lit by the full moon is only about one-tenth of a lux. Cameras that need to function in a darkened office or in an unlit outdoor setting at night can be equipped with infrared or thermal technology, enabling them to capture an image without emitting a visible light. Axis provides a full range of camera types, up to and including explosion-protected cameras for hazardous areas and 360 degree panoramic cameras. An example of a basic entry-level camera in the Axis line is the M11 network camera series. These are compact cameras primarily designed for indoor monitoring, but outdoor-ready models are available. Each type of camera in this line features a varifocal lens, digital pan-tilt-zoom features, local storage and digital I/O. The M1124 is the most basic of the line and has a maximum 1280×720 video resolution, a 720p HDTV resolution and a 1.3 megapixel sensor size. This model is also equipped with a DC iris and Zipstream. The M1124-E variant has a weather-resistant box shell for outdoor use. Both models have a minimum illumination rating of 0.25 lux. 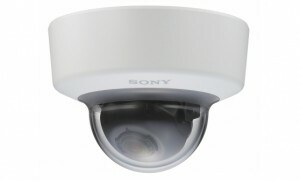 The Axis P3364-LVE is a higher-end fixed dome camera that is optimized for outside use. The camera was designed with both weather and vandalism in mind, able to operate in rain and in temperatures well below freezing. The camera maintains color even in low-light situations and has built-in power-efficient LED technology, and illumination is automatically optimize based on the current level of zoom. P-iris control also allows for precision movement without loss of image sharpness. 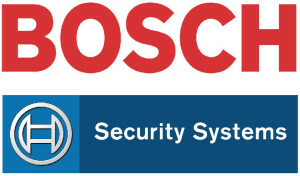 Bosch has a range of fixed, moving and panoramic cameras with PTZ functionality. Box camera, bullet and dome form factors are available. The Flexidome IP 5000 is a good entry-level candidate to look at for an indoor dome camera. 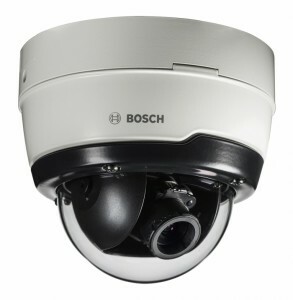 This unit features a varifocal lens, 1080p and 5 MP resolution, E-PTZ and infrared with a viewing distance of 50 feet. Image quality and frames per second can be adjusted through a variety of settings all the way down to 2 FPS and 480p if desired. This model also comes equipped with tamper, motion and audio detection, as well as two-way audio for remote communication through the camera. Color recording requires at least 0.24 lux, but infrared recording can be done with no external light at all. 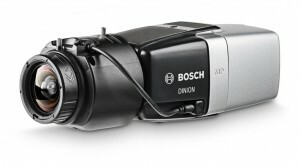 At the upper end of the Bosch product line is the Dinion IP Starlight 8000 MP. This camera is designed to deliver high-quality video around the clock, with advanced low-light performance technology that allows it to operate at a sensitivity of 0.0121 lx at full 5MP resolution in color. In other words, even with very little ambient light, you can still get highly visible color images. The intelligent auto exposure and dynamic noise reduction help to simultaneously preserve storage space while still providing the optimal image quality for each different setting. This camera also comes with the Intelligent Video Analysis feature, which can be set to automatically trigger predefined alarm types and will also add metadata to video to make it easier to search through hours of footage. 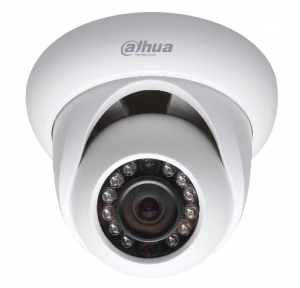 Dahua’s standout features in their camera line are found in their “Ultra-Smart” and “Eco-savvy” lines. These combine the latest in intelligent search and recording technology with power economy. For a mid-range Dahua model, it’s worth looking at the IPC-HDW1200S. 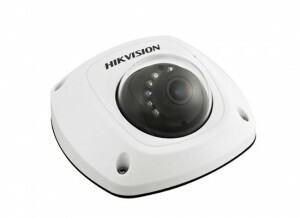 This is a mini-dome camera with infrared capability and 2 MP / 30 FPS recording. Color recording is possible in as little as 0.1 lux, but of course the infrared mode can capture images with no ambient light present whatsoever. Up to four areas of privacy masking are also available. Power can be supplied by either a standard 12 volt DC line or Power Over Ethernet. Another good mid-range model in the Dahau line is the DH-SD32203S-HN, another 2 MP mini-dome but one that features PTZ control. Some added features of this model include intelligent 3D positioning, the ability to use up to 64 GB of Micro SD memory, and a maximum of 20 users on the network at a time. 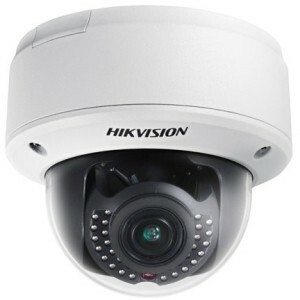 Hik Vision offers a good range of both bullet- and dome-style cameras. Their HiWatch system offers a complete plug-and-play solution for both indoor and outdoor applications. As far as individual Hik cameras go, at the entry-level end you’ll want to look at the DS-2CD2532 F-I 3MP. This is another networked dome camera that features use of up to 64 GB of Micro SD memory and a WiFi audio alarm. It also comes equipped with infrared, and color recording is possible at 0.07 lux. This particular model can be set to angles of view of 98.5, 86, 79, 70, 49 and 43.3 degrees. There is a sister model (the DS-2CD2512F) that has almost identical specs but allows viewing at 92.1, 73.5 and 46 degrees if those particular angles are needed. This other model does have a lower maximum resolution, however: 1280×960, as compared to 2048×1536 for the DS-2CD2532F. A higher-end model in this line that is worth noting is the DS-2CD4132FWD-IZ 3MP. 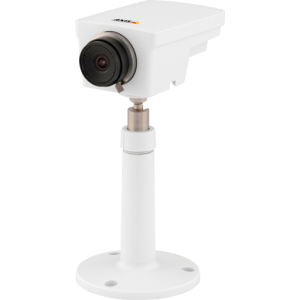 This model offers all the advantages of the lower-end dome cameras, but with a motorized lens that can be adjusted from 2.8 to 12mm in viewing angle. A progressive scan CMOS sensor and varifocal lens offers recording at 2048 x 1536 at 20 fps. Normal color recording can be done at as little as 0.014 lux, and smart IR functionality enables pitch-dark recording at up to 98.4′. 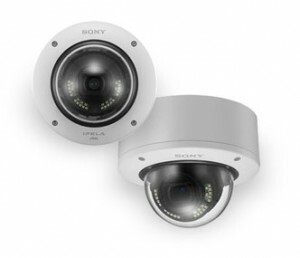 Sony has their hand in nearly every type of electronics in the world, and that extends to security cameras. 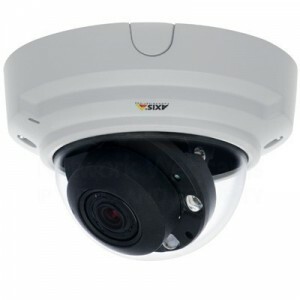 The company offers fixed, dome and hybrid cameras at a very wide variety of price points. At the entry-level end of the product line, the SNC-EM600 is a solid mini dome camera that records at 30 FPS and 720p. Minimum lux for recording is 0.05 for color and 0.04 for black and white. Sony is somewhat unique in adding advanced functions to this lower price range such as face and object detection and a built-in HTML viewer that is compatible with most smartphones. Image stabilization and advanced video analytics are also available. For an upper-end and more rugged camera, give the SNC-VM772R a look. This 4k camera was designed with outdoor application in mind and packs a 1.0-type back-illuminated CMOS image sensor along with a design that repels both weather and vandals. As you might expect with an outdoor-focused camera, the low light capability is among the best on the market with true day/night switching and long-range infrared surveillance recording capability. 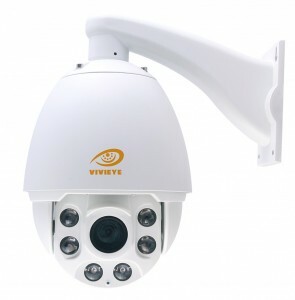 Vivieye is a local company that imports their security camera equipment from various Chinese manufacturers. 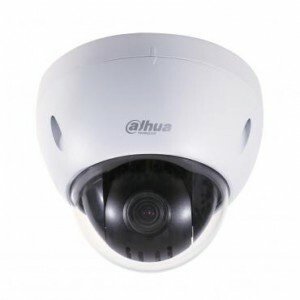 The product range tends toward the lower end, but these also tend to be the most affordable of the CCTV cameras and many are suitable for basic purposes. 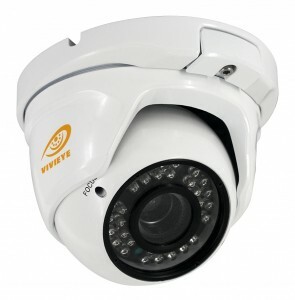 A good basic camera from Vivieye is the IPC-4960NK. This is a waterproof 960P 1.3 MP camera with a built-in Web server, motion detection and eight unique simultaneous viewers. It does have infrared support as well, with a maximum range of 20 meters. One minor limitation with this camera is that it has a maximum recording speed of 25 FPS, which means you can’t get completely gap-free video, but it does offer color filming at only 0.1 lux. The company’s highest-end camera is the HSP-667-C27G. This is a high-speed dome camera that features waterproof construction, rain detection and automatic adjustment, and intelligent laser illumination at up to 80 meters. One limitation to take note of is that it only supports DC power, power over Ethernet is not available with this model. As this survey of the field demonstrates, there is a camera available at each price point and for every feature set that your home or a business might need. If you’re still uncertain about what your exact coverage needs are (such as whether an IP camera is appropriate for your setup), use the quote form on right side-bar to get one of our CCTV professionals to contact you and answer any questions you have.